Over the last 7 days, the Greater New York Red Cross provided emergency assistance to 73 adults and 23 children following 36 local disasters. Here are some highlights from last week and a preview of upcoming activities (see below). In honor of #NationalFirePrevention Week, our #GetAlarmedNYC program continued their year round efforts towards #MakingADifference in our neighborhoods and creating a safe, disaster free environment. 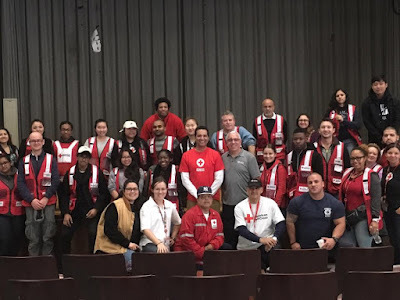 On Wednesday, Red Cross Board of Directors not only talked the talk, but walked the walk, as they teamed up with #GetAlarmedNYC members to help install fire alarms in several homes and apartments in Spanish Harlem. ESPN SportsCenter anchor, Kevin Neghandi, also teamed up with the Home Fire Campaign team this weekend participating in a great #GetAlarmedNYC installation day outing in the Bronx. The New York Junior League kicked off their “Around the Clock” 115 consecutive hours of volunteer service by cleaning cots and building shelter kits to help the Red Cross prepare for the next emergency. On Tuesday, a fire in Mariners Harbor, Staten Island left a home completely damaged. Luckily no one was hurt. Representatives of the Red Cross were on the scene to provide immediate assistance and emotional support to the affected family. Over the weekend, more Red Crossers headed down south to join the Hurricane Matthew relief efforts. Amongst these Red Crossers was Long Island CEO, Neela Lockel. Over 45 local Red Crossers from the Greater New York region have been deployed. Oct 17-19: The New York Junior League (NYJL) continues their “around the clock” 115 hours volunteer marathon to honor the 115 year anniversary of NYJL. We are extremely excited to be teaming up for this phenomenal effort. If you are interested in volunteering, please visit the link for more information on how to sign up. Oct 19: Supporting Volunteer and Managing Teams Workshop at the Greater NY Chapter (Oct 22. In Long Island). If you are a supporting volunteer or team manager, please take advantage of this engaging course. You can sign up and learn more about SVMT here. Oct 19, 25, 27: Red Cross blood drive: 2 to 7pm: 520 West 49th Street, Manhattan. Schedule an appointment to donate today. Oct 21: #GetAlarmedNYC is in full swing and serving neighborhoods all across NYC.Volunteer to help out, or sign up to get a free smoke alarm installed in your home. Nov 6: For current Red Cross Volunteers, the Greater NY Region is recruiting over 150 volunteers to support the Marathon medical team as course spotters in the post-finish area of the New York City Marathon on Sunday, Nov 6. Volunteers working this event will be required to have a current CPR certification. CPR training will be provided at no cost for volunteers who are not certified. Sign up today!